For those of you who did not know, I am a lover of all things romantic. Growing up, I read many romantic novels and utterly enjoyed them. 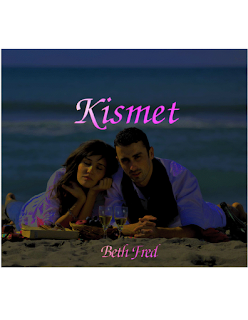 When I saw the cover of Beth Fred’s book Kismet, I was intrigued. I picked up the book during my lunch time intending to read a couple of pages and I ended up reading the entire book! I decided to do a book review in case some of my readers are avid readers. This book will appeal to everyone on different levels. From the single girl waiting for her prince charming, to the desperate housewife wistfully wishing for a life of romance! The book Kismet appealed to me as a reader because the characters are realistic and well developed. These characters could be anyone you or I know. The story line is also very easy to follow. The book Kismet also offers adventure, romance and intrigue. In the sandy beaches of Cancun, Tiffany meets a stranger who arouses powerful latent feelings that she had buried with her failed past relationship. The main character Tiffany is a conservative good girl unlike her wild party girl younger sister. When trouble threatens in paradise, a mysterious stranger helps her navigate a foreign land while kindling the fires of romance. The final twist in the story line leaves the reader satisfied and waiting for more books by Mrs. Fred! Read a full review on Smashwords.com and get your copy of Kismet at Amazon.com or at Barnes &Noble. Have you read a good book lately? If so, what was it?